We are after some advice regarding peeling paint/powdery plaster on this internal wall that has high damp levels. We have tried replacing the gutters on the nearby roof and a plumber came to look at pipe work and deactivated the outside tap which was the only nearby pipe incase this was leaking on the wall. I have tested damp levels and the meter shows highest readings on the patch of wall that is now exposed (no paint) - this is around 25%. The bottom of the wall above skirting is approx 15% - the top of the wall is very little. The wall was the old outer wall before an extension was built on it many years ago. The house is circa 1850. Does anyone have any suggestions on what we should do to rectify this? It is quite an urgent job as we want to fit solid wood flooring in the next room but we need to fix this wall once and for all first! edit: you can see on the top picture there is also a discolouration on the adjoining wall above the skirting board? given the age of the building almost certainly an issue with cement based render/plaster vs summat with an additional lime content. Lime will allow the wall to breathe. 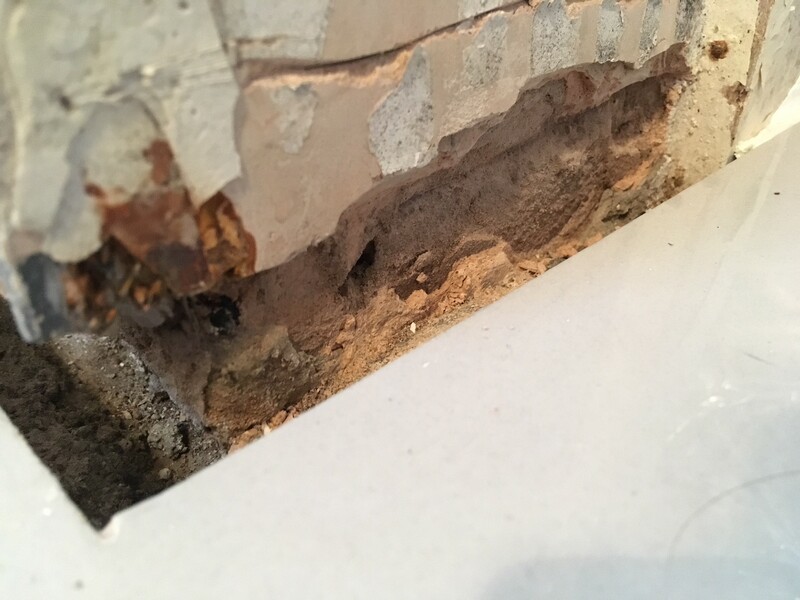 This wall with the issue was the old outer wall before the kitchen extension was added, and i'm pretty sure it is a limestone structure or something similar. What would you suggest as a solution? 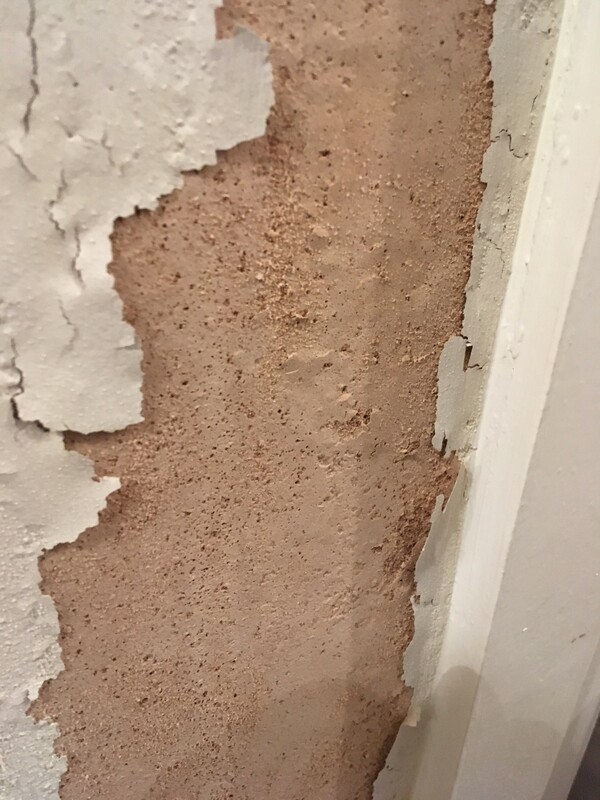 Is there a certain type of plaster that is not cement based that would be more suitable? We have not had this issue anywhere in the house after nearly 5 months here, so it seems strange that it is just this small patch affected. 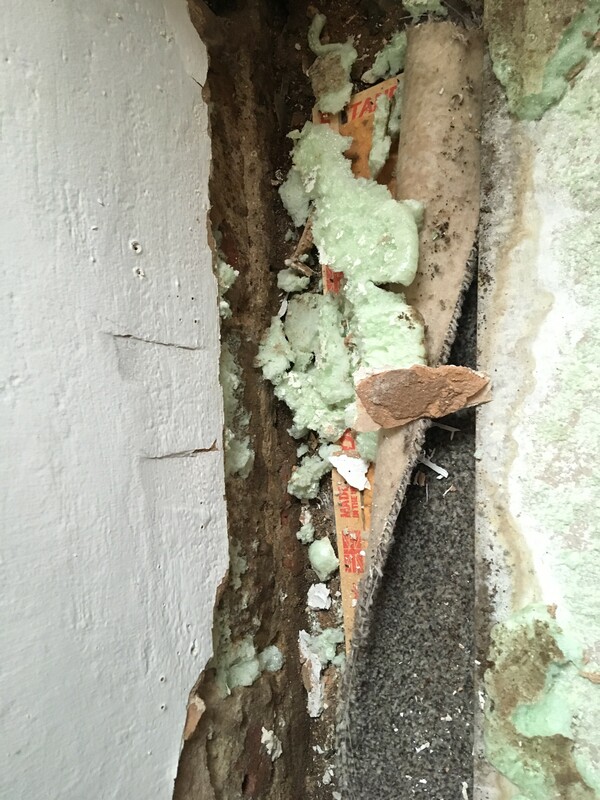 Rip off the existing plaster, allow the wall to dry fully. (picked at random from a search.) Allow to dry. Repaint with a non vinyl matt emulsion. who did the extension? maybe dampwork was also done with the wrong mix at that time? after knocking off the plaster on the reveal and maybe both sides of the wall, cut free the metal angle bead its rusting. remove the skirting and check the wall and back of the skirting. plaster or render should stop short of solid floor. 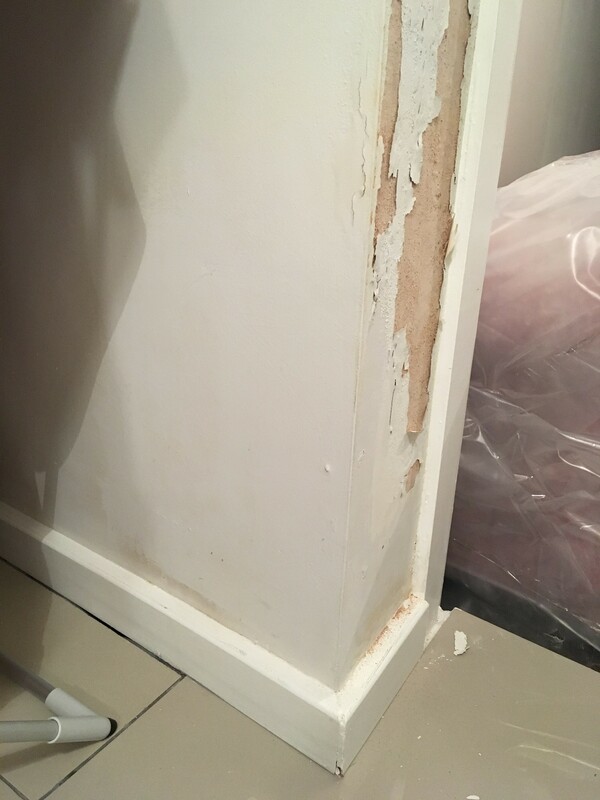 have a close look at both sides of the length of the wall, if damp has come up there then it maybe working its way up somewhere else? when youve hacked off to the background why not post photos. 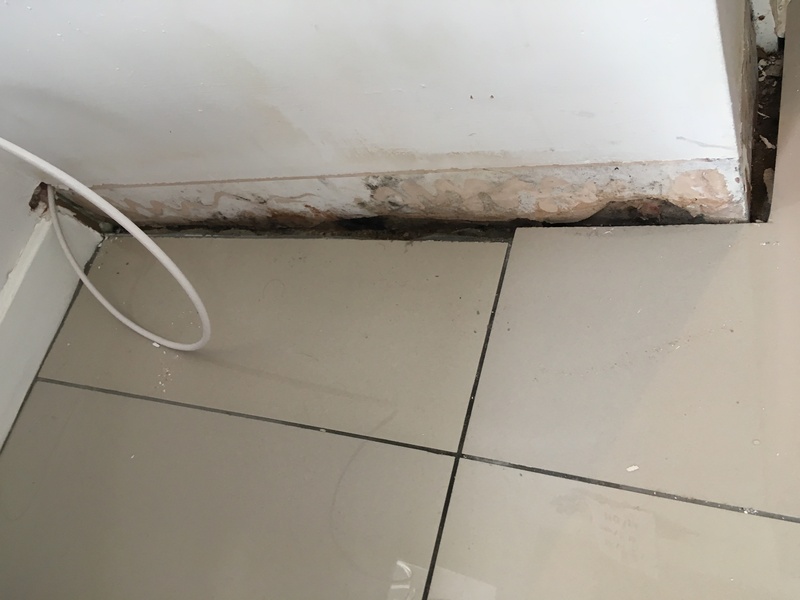 Update: skirting boards removed, they felt damp in places. The living room wall seems to have a foam like material behind skirting board/plaster board. Any idea what this is and should it be there? Could this be the cause? 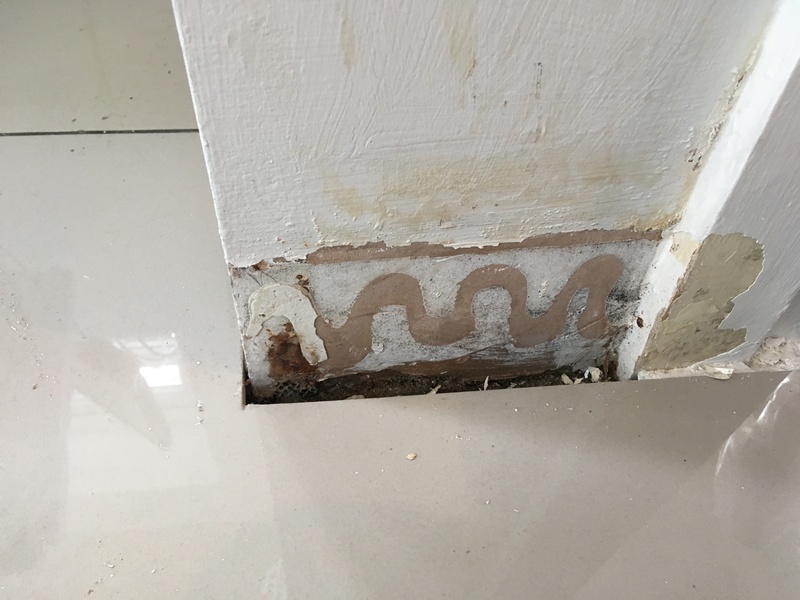 the stuff is foam adhesive, got nothing to do with damp.like i said, you have to knock off all damp plaster and cut rusting angle beads,then post more photos. is the carpet floor suspended? It sounds like the source of the damp is coming from your wall (obvious I know, but it can sometimes be from condensation in the air). The plaster has been taken quite low down, a bit too close to the ground floor, especially on the corner next to the tiles. There has to be a one inch gap as a minimum. However, I don't think this is the main cause of the problem, just a contributing factor. You mention the house is circa 1850, but an extension has been built through that doorway. Does that particular wall have a cavity? The reason I ask is because my friend came to realise that a leaking bottle gully (the small sort you get under an outside tap) was leaking underground. 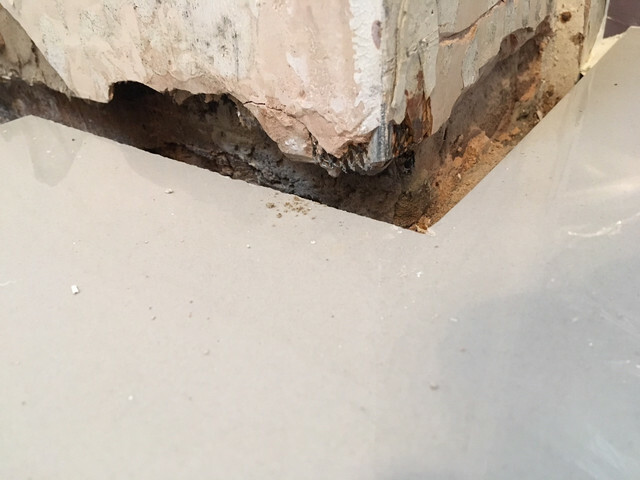 The underground brickwork joints had been damaged and had gaps in it (this is quite common) and so the water from the bottle gully was entering the cavity, albeit below ground level. 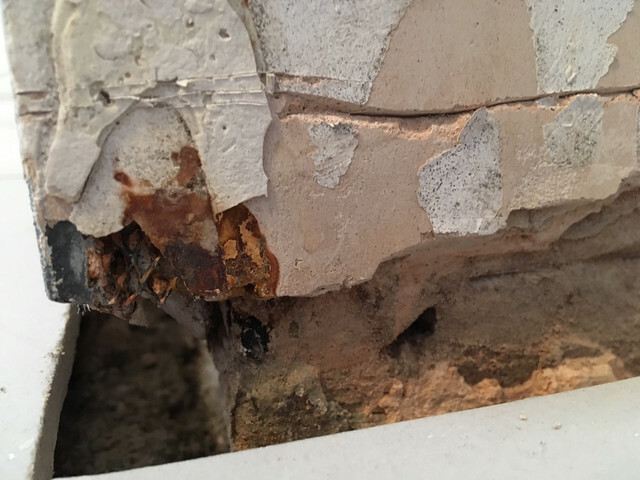 It turned out the water was then running around his house (between the inner and outer brickwork) to the other side of his house and causing damp on one wall. After the bottle gully was replaced, the problem sorted itself out pretty swiftly. Also, like wes56 asks, what type of floor construction is it? There is one other possibility. As it's a former external wall, with an extension, the source of the moisture could be from above. Have you checked the join in the roof between the extension and the original house? If single storey extension, then the new roof has to tie into the original external wall, usually requiring lead flashing, which can be problematic if not done correctly. One quick thing I would recommend though - don't simply replace the plaster with new plaster, even if the new stuff is moisture resistant. You'll only be masking the problem, you need to address the source. So I have hacked the bottom of the plaster off (most of it was touching the ground) and cut the rusty angle bead. One thing I noticed is that the wall with the major peeling problem is plaster straight onto whatever brick the house is made of. The longer wall was plasterboard - which did have some damp marks but no peeling plaster/paint. 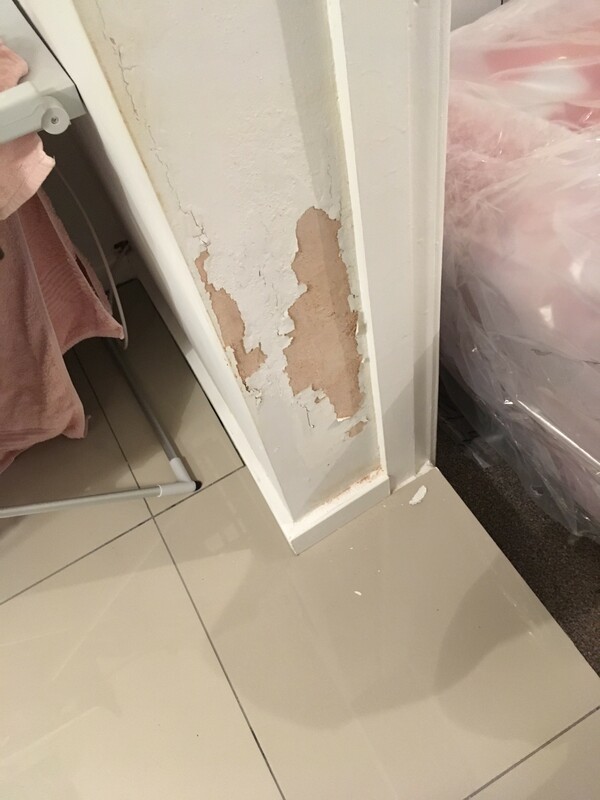 The plasterboard touching the ground was probably the cause of this - do you think that will resolve the discolouration on this wall? 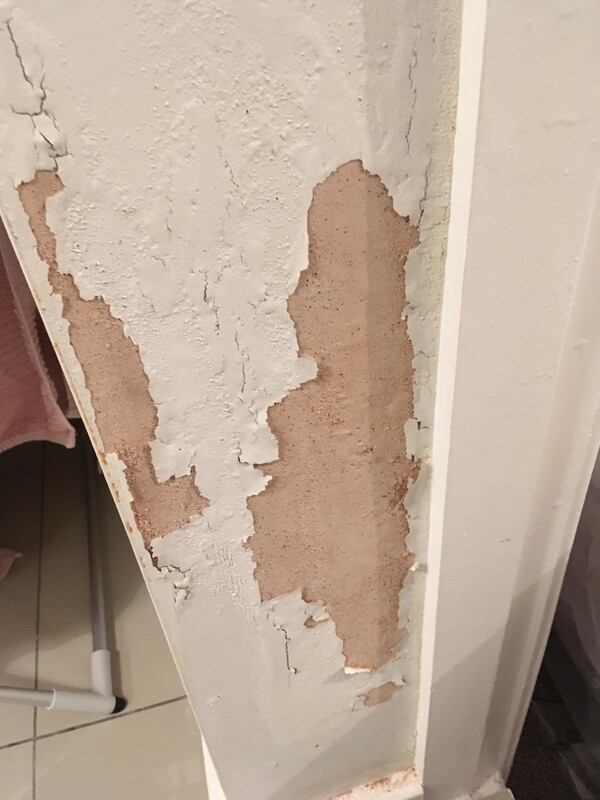 What would you suggest as the best course of action now for the peeling wall? Get a plasterer in to re-do with lime based plaster? Or fit plasterboard instead? Or would this just be masking a deeper problem? New Paint Peeling off .... HELP!! Peeling + Oil-based or not?